Shashtra Seema Bal (SSB) will announce the SSB Result 2018 at www.ssbrectt.gov.in. Physical Efficiency Test is the first stage of the recruitment process. Hence after conduction of PET/PST recruitment body will release the names of the candidates qualified in PET/PST. The qualifiers have to appear for the written examination. SSB will announce the provisional result after 10 days of written exam. And after almost 15 days later it will release the final result for the written exam. After the shortlisted candidates ( for the post of ASI and Head Constable) have to appear in the skill test. At last SSB will release final merit list of the recruitment. 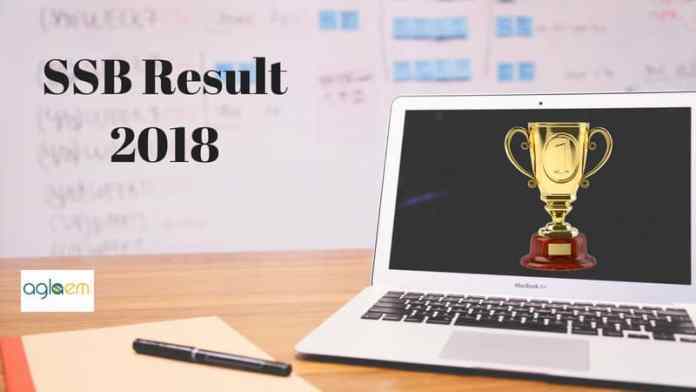 Candidates can get more details about SSB Result 2018 like the process of checking the result, pay scale, selection process etc. Till now, the examination dates have not been announced yet. The official notification does not contain any details about the exam dates. But it contains a proper schedule of result declaration. The result will be declared accordingly. Result: Candidates will be able to download the result from www.ssbrectt.gov.in. As the first stage of SSB recruitment is Physical Efficiency Test / Physical Standard Test, hence SSB will release the result for it first. The candidates who will appear in the PET/ PST will able to check the result by following the given steps. First of all click on the above link which will redirect to the result page. Thereafter candidates have to enter the login credentials for fetching the result. On entering the details the result page will open. Like PET/PST SSB will release the result for the written examination as well. The schedule for the written result declaration is provided above. SSB will announce the result on www.ssbrectt.gov.in. The method of checking the result will be the same as the earlier. The candidates will have to enter some login credentials for checking the result. After completion of each stage, the SSB will release the final merit list of for the selected candidates. The merit list is purely based on marks obtained in written exam. In order to be selected the candidates have to obtain the minimum qualifying marks in Paper I and II. The marks differ for each category. After final selection, the shortlisted candidates will be called for the detailed medical examination. In DME candidates will be tested for their medical fitness. SSB will call 03 times of category wise candidates for DME. In DME if any candidate will be found fit then he/she could proceed with the recruitment process. Being declared fit in Medical Examination will in no way give an entry in SSB, the selection is strictly dependent on the merit list. After completion of completion of Review Medical Examination, SSB will prepare the final merit list. The merit list will be dependent on the order of merit and category wise vacancy and cut off marks. While preparing the merit list, tie cases may occur. Then recruitment body will use the following methods to resolve the ties. The candidate who will secure higher marks in Paper II will be ranked higher. If the tie still persists then the elder candidate will get the preference. If both candidates share the same date of birth then SSB will focus on the alphabets of the name. The selected candidates will be paid as per the 7th Central Pay Commission. The candidates will be paid as per the data are shown in the table. Sub-Inspector (Staff Nurse Female) only for female Level-6 Rs. 35,400/- per month. ASIs Level-5 Rs. 29,200 per month. Head Constables (Ministerial) Level-4 Rs. 25,500/- per month. And other admissible by SSB.